Overview: Let’s take three outcasts, who find themselves with special abilities as the result of accidents. None can fit into society, and have no where else to go. Let’s organized them behind the leadership of a wheelchair-bound genius. Is this the X-Men? No, this is the Doom Patrol! First there is Robotman. Cliff Steele was race car driver who was involved in a deadly crash. With his body shutting down, a skilled doctor (Niles Caulder) removes Cliff’s brain and places it inside a steel body. Robotman has been the anchor point for every incarnation of the Doom Patrol. Next up is Elasti-Girl. Rita Farr was an Olympic athlete and a Hollywood movie star. While on location in Africa, Rita is exposed to some mysterious gases, which gives her the ability to grow or shrink her body, but it’s an ability she cannot control. Giving up her career, she goes into hiding until she is recruited by Niles Caulder to join his team. Let’s look at Negative Man now. Larry Trainor flew through a radioactive field while test piloting a jet. Filled with a mysterious energy, Larry can send a black negative form out of his body, which can fly and move objects at will. That negative form can only be outside of Larry’s body for 60 seconds, or he risks dying. Because of the radioactivity, Larry must wrap his body up in protective gauze, so he does not expose those around him to the radiation. He too is recruited by Niles Caulder. Finally, the Chief. This is the Niles Caulder that has appeared in everyone’s story. A genius confined to a wheelchair, Caulder directs his team to help humanity any way they can, even though humanity wants very little to do with them. Initially, the Doom Patrol fought many of the same foes over and over, month to month. We get a lot of appearances by General Immortus, a man whose seen way too many birthdays in his long life. The team also matches up with Animal-Vegetable-Mineral Man, whose body can morph into any item that can be classified as one of those three objects. As the book progresses, new heroes join the team, such as Mento (secretly Steve Dayton, the sixth richest man in the world) and Beast Boy, a green-skinned teenage boy who can transform himself into any kind of animal. But as the team grows, so does the threat level, with more powerful foes like the Brotherhood of Evil,. Why should these stories be Showcased? : I was really surprised about how much I ended up enjoying this volume. The plots of the stories can be somewhat kooky, but the interactions between the characters really feels like a 1960s Marvel Comic. Despite an explosive finish to their title, which we will discuss in more detail with Showcase Presents The Doom Patrol Vol. 2, these characters have stuck around in various incarnations for 50 years. When Arnold and Bob developed Beast Boy, I really think that was done to add some youth to the title. I don’t think anyone could have ever imagined he would become such a critical character for DC in the Teen Titans. Anyway, I would say track down a copy of this book, especially if you are a fan of the Silver Age Marvel Comics. 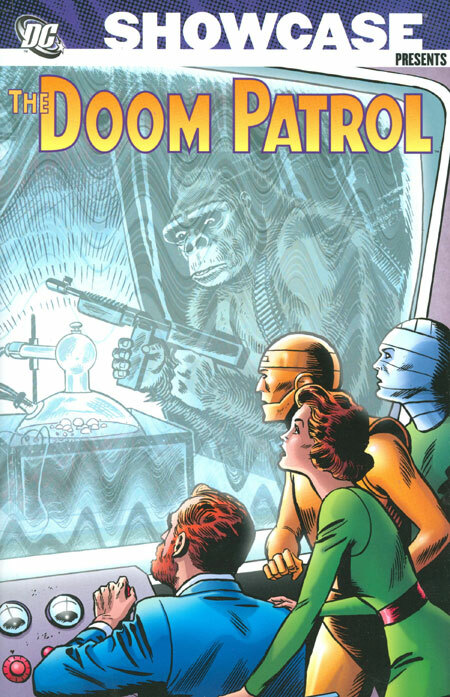 MIA (Missing Issue Alert): In the final issue in this collection, Doom Patrol #101, the Challengers of the Unknown appear in the last panel. This was to set up a crossover with Challengers of the Unknown #48, the first of a two-part story which would be finished in Doom Patrol #102. However, the Challengers issue was not included, either in this volume or in Showcase Presents The Doom Patrol Vol. 2. And the Showcase Presents Challengers of the Unknown line has yet to reach issue #48. So you may need to hit the back-issue bins to find this comic to complete the story. If you like this volume, try: The Doom Patrol Omnibus by Grant Morrison and Richard Case. In the mid-1980s, following the events of Crisis on Infinite Earths, DC relaunched The Doom Patrol, returning the team to it’s traditional roots and characters. However, after 18 issues, DC opted for a change, and gave the book over to a very young Grant Morrison, a Scottish comic book writer best known for his work on Judge Dredd. His work had finally caught the attention of DC, and they had already started him on Animal Man. Beginning with issue #19, Morrison took over Doom Patrol and flipped it on it’s head. Ditching most everything but Robotman, Doom Patrol went on an eccletic ride for four years under Morrison’s direction, making the strange the norm. By the end of Morrison’s run, DC had moved The Doom Patrol under the Vertigo banner. Morrison’s run has been reprinted multiple times in trades, and most recently as an omnibus.